Homeoprophylaxis is defined as the use of potentized substances (homeopathic remedies) in a systematic manner to prevent the development of the characteristic symptoms of disease. Homeoprophylaxis is intended and understood as a type of immune system education which may reduce susceptibility to certain infectious organisms by strengthening the constitution. Homeoprophylaxis can involve the use of homeopathic nosodes (remedies prepared using disease organisms), or homeopathic remedies made from mineral, vegetable or animal substances. Nosodes are NOT homeopathic vaccines, nosodes are simply homeopathic remedies made from disease products and have many different applications other than potential disease prevention. On the other hand, many common homeopathic remedies made from plants and minerals have traditionally been used in homeoprophylaxis, such as Belladonna (deadly nightshade) for the prevention of scarlett fever symptoms or Lathyrus sativa (blue sweet pea) for the prevention of polio symptoms. The media tends to misrepresent this issue. Homeoprophylaxis has a 200-year history of safety and effectiveness. You can learn more at Free and Healthy Children, a website dedicated to Homeoprophylaxis. I am a member of FHCI and follow their protocols. Homeoprophylaxis is NOT homeopathic vaccination. There is no such thing as homeopathic vaccination, actually. Vaccination and HP have similar aims but are two entirely different approaches. Homeoprophylaxis is NOT considered to be an alternative to conventional vaccination in Canada or the US, however it has been used successfully in many countries historically as well as more recently in large-scale studies in countries such as Cuba and India to prevent a number of infectious diseases. Parents are strongly encouraged to do their own research, no matter if they wish to vaccinate, partially vaccinate, not vaccinate or use homeoprophylaxis. Decisions should be made based on individual and family history, laboratory testing, including testing for mitochondrial disorders if indicated, as well as personal research and conviction. As a homeopath I do NOT advise parents against vaccination or in favour of HP, but instead hope to assist parents in making their own decisions. Dr. Isaac Golden from Australia is one of the foremost researchers and voices in the field of homeoprophylaxis today. In this video he gives a brief introduction to homeoprophylaxis and also discusses it with a doctor from the Finley Institute in Cuba, which conducted numerous large-scale trials with homeoprophlaxis, including the treatment of 2.3 million people to prevent leptospirosis. Samuel Hahnemann, the founder of homeopathy, accidentally discovered the power of homeopathy to prevent as well as treat infectious diseases in 1798. He was treating a little girl with Belladonna, also known as Deadly Nightshade, when the rest of the family came down with scarlett fever. The little girl did not develop the illness and Hahnemann deducted that the remedy, which he also often used to treat scarlett fever, protected the child from contracting it. He then began using Belladonna for the prevention of scarlett fever in his community and shared his knowledge with other doctors, who had the same successful experiences. Ultimately, the Preussian government adopted and ordered the use of Belladonna for the prevention of scarlett fever. What Studies have been done on Homeoprophylaxis? Many observational as well as scientific studies have been done over the past 200 years using homeoprophylaxis. Here are a just a few examples. More information on these studies, with references can also be found here (Human Records, Studies and Trials of Homeoprophylaxis.) There also is a selection of research on my website under Homeoprophylaxis Research. 1849: Dr. Clemens von Boenninghausen treated and prevented “untold” numbers of cholera infections during the 1849 European epidemic. While a death rate of 54-90% occurred with conventional treatment, Boenninghausen’s patients had a mortality rate of only 5-16%. 1918-1920 Influenza (Spanish flu) epidemic in the US. The general mortality was 30%. Death rate among those treated homeopathically was 1%. Brazil 2009-10: A double blind, randomized, placebo controlled with 600 children ages 1-5 was condicted. One group received a homeopathic complex called ARI, another received a homeopathic remedy made from Influenza A and a third received placebo for 30 days. The children were monitored for 12 months. No deaths or injuries were reported. The HP group was found to be least affected by flus. 1800s: Dr. Grimmer of Chicago: 5,000 young children treated with a homeoprophylactic. None developed polio. 1850: During an epidemic of poliomyelitis, Dr. Taylor Smith of Johannesburg, South Africa protected 82 people with a homeoprophylactic. Of these people, 12 came into direct contact with disease. None were infected. 1956-58: Dr. Eisfelder treated over 6,000 children with a homeoprophylactic. No cases of polio were reported in the group and no side-effects were observed. 1957: A severe poliomyelitis epidemic occurred in Buenos Aires. The majority of homoeopathic doctors prescribed a known homeoprophylactic as a preventative. Drug stores distributed thousands of doses to the public. None of those who used the prophylactic registered a case of contagion. 1975: During another poliomyelitis epidemic in Buenos Aires, 40,000 were given a known homeoprophylactic for the disease. None developed poliomyelitis. Cuba, 2007-8: 2.3 million treated in late 2007 re annual leptospirosis epidemic. Remaining 8.8 million were untreated. 84% decrease in disease incidence, complete control of the epidemic. The protective effect continued into 2008 with an 84% reduction in leptospirosis cases for the treated areas though no further prophylactic had been given. Leptospirosis infections in untreated areas increased by 22%. 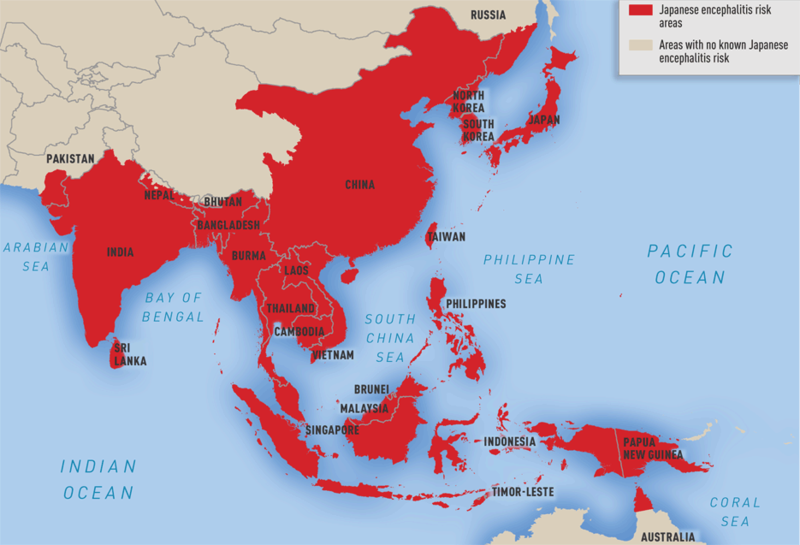 Japanese Encephalitis is one of several important viral encephalitis diseases world-wide. It is an emerging disease in India and primarily affects children under age 15. It is the leading cause of Acute Encephalitis Syndrome (AES) in Asia. The virus is transmitted with mosquitoes and the disease is fatal in about 30% of cases with another 30-50% suffering long-term serious neurological sequelae. Japanese Encephalitis Virus Distribution. Courtesy of the CDC. Over the past 60 years, it has been estimated that JE has infected 10 million children globally, killing 3 million and causing long-term disability in 4 million. Andra Pradesh, a state in Western India, has about 40 million children. First outbreaks of JE were reported in 1979. In 1999 recorded J.E. cases were 5308, and 1511 children died. The government chose homeoprophylaxis in 1999, due to ineffective vaccines and problems with distribution. 20 million children were treated with a three remedy protocol of Belladonna, Calcarea carbonica and Tuberculinum. 2003 and 2004 no cases were recorded. Dr. Isaac Golden, PhD, Australia, conducted a long-term study of using homeoprophylaxis over fifteen years, from 1985 – 2005 with 3000 children. He used three groups of children, one group of fully vaccinated children, one with unvaccinated children and one with children who were given homeoprophylaxis. Long-term health outcomes showed that the children who received homeoprophylaxis were not only protected against infections that vaccines are used for by 90% which is comparable to regualr vaccination, but that they were the healthiest children of the tree. The fully vaccinated children were the least healthy, with the highest numbers of infections, respiratory issues, allergies and developmental and behavioural problem. ​You can read a more detailed article by Dr. Golden about HP here. Also see his PhD thesis here. ​See books by Isaac Golden here. Please visit Free And Healthy Children International for a detailed description of the homeoprophylaxis program. I am available for assistance. Please feel free to inquire, but please read the information on FAHC first. This is the companion booklet to the Homeoprophylaxis program as overseen by Free and Healthy Children International for North America. In order to participate in the program you must be under the supervision of an HP Supervisor. 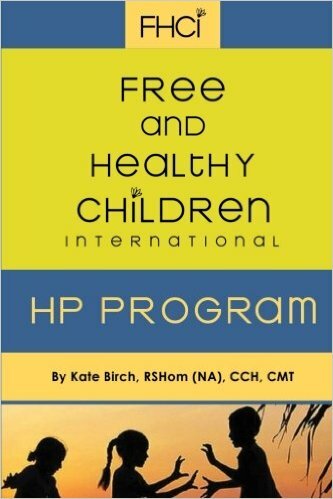 To find an HP Supervisor in North America and Europe please go to freeandhealthychildren.com. ​There Is a Choice: Homeoprophylaxis by Cilla Whatcott is written for parents asking the question, “Besides traditional vaccination, what other choice do we have?” Cilla shares her journey of starting out on a conventional medical path and making a dramatic change to homeopathy after her youngest daughter is vaccine injured. Follow her personal account of current research about vaccine safety, how the immune system is meant to function, the history and application of homeoprophylaxis, and advice about how to make critical decisions regarding your children’s health. ​Included is a foreword by Isaac Golden, and material from his recent publication. Along with a chapter on Dr. Golden’s work, Cilla reports the latest information about the effectiveness of homeoprophylaxis from leading researchers around the world. "Cilla is a wonderful mom & accomplished healer sharing what she has learned in an accessible down-to-earth manner. What a valuable resource for any parent – practical knowledge from a parent who has been there, done that, and gleaned gems of wisdom from the hard lessons along the way. What a wonderful gift for any parent…I wish I'd had this guidance when my son was little!" Review by Kim Kalina, CCH RHom (NA). 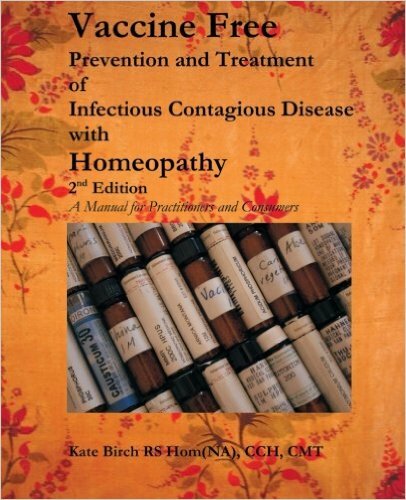 Vaccine Free - Prevention and Treatment of Infectious Contagious Disease with Homeopathy, written by Kate Birch is a magnificent volume for advanced students and practitioners of homeoprophylaxis. *The content of this website is not to be misconstrued as medical advice nor does it replace the consult of a physician or qualified medical practitioner. Reader assumes the responsibility of investigating for themselves disease prevention methodologies that concur with their beliefs and understanding.